"Sweet blueberries and tart lemon pair well in this alternative to oatmeal. 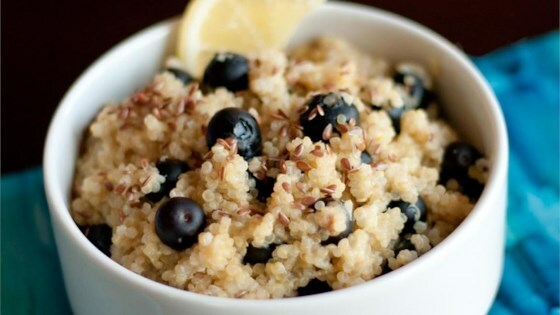 High in protein and fiber, quinoa is a great start to your day! I made this up one morning when I had a craving for quinoa and was looking for a change from the usual. Top with extra milk for a thinner consistency. Also good with a sprinkle of cinnamon or nutmeg." Heat milk in a saucepan over medium heat until warm, 2 to 3 minutes. Stir quinoa and salt into the milk; simmer over medium-low heat until much of the liquid has been absorbed, about 20 minutes. Remove saucepan from heat. Stir maple syrup and lemon zest into the quinoa mixture. Gently fold blueberries into the mixture. Close to being really good, but the Quinoa was just too bitter...I did try to rinse the quinoa, but that turned out to be the most challenging part of the whole recipe. Made it with water instead of milk; it is delicious! Tried it and love it. A perfect way to get a boost of protein to start your day.